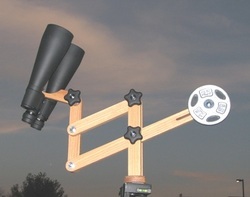 The kit includes all pieces necessary to assemble a complete LW Standard Bino Mount. The Burgess Optical Red Oak LW Standard Mount is a parallelogram binocular mount. The LW Standard Mount allows easy adjustment of the binocular height, both for sharing the binoculars with others and for maintaining the same eyepiece elevation relative to ground when viewing objects at different altitudes. Terry Alford, an East Tennessee master craftsman, makes each LW Standard Mount. The LW (Light Weight) Standard is suitable for binoculars up to about 3-1/4 pounds. The LW Standard Mount include metal bushings that act as bearings. The LW Standard mount has approximately 16 inches of vertical travel. The LW Standard Mount includes an altitude adjustment. The mount is adapted to be attached to a photo tripod head, such as a pan head or a three-way head (as shown in the photos). The mount comes with a 1/4x20 threaded opening in the base and is available with a 3/8x16 threaded opening. The LW Standard Mount is not shipped with a counterweight. Depending up the weight of the binoculars, either a standard 2.5 or 5 pound barbell weight makes a fine counterweight. Barbell weights are available at many sporting goods stores and at Walmart. The LW Standard Mount has been designed to use standard barbell weights in order to minimize the shipping weight, which keeps the cost of shipping low. The LW Standard Mount comes with the hardware necessary to attach one weight. The counterweight attaches to the lower arm of the LW Standard Mount and slides in a slot to compensate for the weight of the binocular. Lighter binos require the counterweight moved towards the binos, and heavier binos require the counteweight moved away from the binos. For larger, heavier binos, one 5 pound can be used, or two 2.5 pound weights can be used with one weight on each side of the lower arm. A 3 inch by 1/4 inch carriage bolt is required if two weights are used, and the bolt is readily available at any hardware store. The opening in the weight can be filled with 1 inch flat washers (about 6 to 8 are needed, depending up the thickness.